When reviewing a website builder or deciding if a website builder is the right one for you, there are many variables that need to be taken into consideration. Even the worst website builder around could be great for some types of people. If you only need to create a landing page without a lead form for example, design isn’t that important to you, all you need is to convey a message – it really doesn’t matter what website builder you choose (if any). However, if you are planning on building an eCommerce website, you need to do your homework and so do we. If a website builder doesn’t have the ability to do something that there is a good chance you will need on your website at some point – we will let you know. Site123 is one of those websites that is very simple to use, but doesn’t necessarily have every other option that other website builders have. You could read a good example of that on our Wix review. If you’ve tried out a few website builders in the past, you probably know that the design of the site is determined mainly by the theme that you choose. Site123 is no different. You choose a template (layout and style) for your site and that is your base to build on. You can take a look at all the templates you can choose from and see that they basically have all the options covered. As you can see, Site123 has 4 different prices + the free option of course. 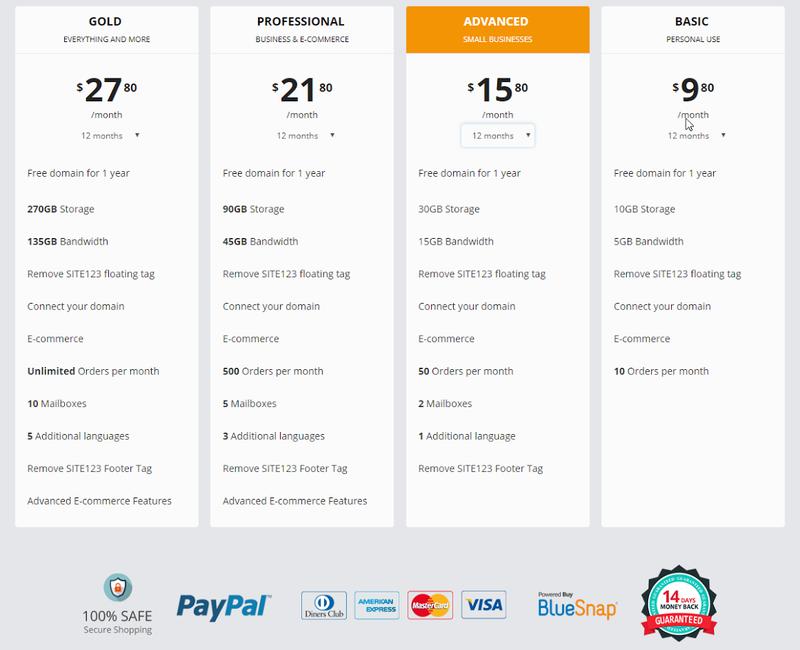 The free Site123 website doesn’t give you your own domain (obviously) and it has Site123 branding on the site. So if you need a site without the website builder adding their own banners on it, this option is not for you. The basic option is just fine for most websites. Among other things, it offers 10GB of storage, 5GB bandwidth (not bad at all) and an eCommerce website with up to 10 orders a month. Though, this option still has a Site123 footer tag on it, so it really depends on you if you are ok with that or not. The 3 other options give abilities such as more storage, more bandwidth, more eCommerce orders, business mailboxes and extra languages. Overall, even if we choose the most expensive option – $27.80 is a really good price option. Website builders aren’t exactly known for their loading speed. If you analyze super fast loading sites, none of them are built with a website builder. Most of them are built either from scratch or using a known CMS such as WordPress which has various plugins that were built specifically for speed issues, and regardless, since it’s an open source CMS, many savvy users know how to tweak the code to their advantage. That being said, the page loading time on Site123 is pretty good when putting it against other website builders. After trying a few different sites, the average page load is about 6 seconds. There were a few that were over 7 seconds but there was also a 5 second one so take this as a benchmark. 6 seconds for a website builder is not bad at all. Site123 have obviously taken SEO into consideration when building their website builder. They have friendly URLs, they have the option of editing the meta title and meta description, you can pick the image that will show up on social sites such as Facebook and Twitter, etc. However, it appears that you can’t edit the alt tags on images. This might change in the future. Overall, not bad. Site123 offers live chat support 24/7 and their response times are considerably good. They usually reply to your chat within 2-5 minus tops. There are a whole lot of website builders out there that have many features but their features may over blot the code which will result in a slow site. Site123 may not have as many features as Wix for example, however it loads faster and will possible be a better fit for people that need a simpler website. Overall, it’s a pretty good choice.